The only incorporated community in Mono County, California, Mammoth Lakes is a picturesque, little mountain town among the Sierra Nevada mountains. The town is situated not too far from the border between the states of California and Nevada and covers an area of 25.31 square miles. Mammoth Lakes has an estimated population of around 8,000 people and is located in the Pacific Time Zone. The area was inhabited by Native American Mono people for many years in the past, with the first European settlers arriving in the area in the late 19th century. In 1877, a group of four prospectors came to the area and claimed the nearby Mineral Hill for mining purposes. They set up a company and gold was discovered in the area, leading to many other settlers arriving there. The area was known as Mammoth City at the time, but it didn't take long for the mine to dry up and most of the population to leave. Some decided to remain in the area, turning to logging as their primary economy. The town eventually got the name of Mammoth Lakes and gradually became known as a good tourist spot as years went by due to its location among the mountains and the establishment of a nearby ski resort: Mammoth Mountain Ski Area. Nowadays, Mammoth Lakes is seen as a prime recreation spot for the state of California. The ski resort is the main attraction, but the area around Mammoth Lakes also boasts natural hot springs as well as many acres of forest to explore, while the town itself is also home to the popular Mammoth Ski Museum. Elevation is a geographical statistic, most commonly measured in feet or meters, that denotes how high or low a location is in relation to the mean sea level of Earth. Elevation has a variety of practical uses and can strongly affect an area’s climate. The elevation of Mammoth Lakes is 7,880 feet (2,402 m), which is exceptionally high for a town or city. Most major urban locations around the United States and even internationally are located in low-lying coastal regions at elevations of 500 feet (152 m) or lower. The average elevation in the United States is 2,500 feet (760 m), so the elevation of Mammoth Lakes is over 5,000 feet (1,524 m) higher than the national average. The average elevation in the state of California is the 11th highest in the country at 2,900 feet (880 m), so Mammoth Lakes is one of the highest points in the entire state and is technically the highest incorporated community in California. The highest elevation location in all of California is Mount Whitney, which is also the highest mountain in the contiguous United States and has an elevation of 14,505 feet (4,421 m), while the state’s lowest point is Badwater Basin, which has an elevation of 279 feet (85 m) below sea level and is also the lowest elevation point in all of North America. Most of California’s big cities are located along the coast, resulting in vastly different elevations when compared to Mammoth Lakes. Los Angeles, for example, has an average elevation of around 285 feet (87 m), while San Francisco has an elevation of 52 feet (16 m), San Diego is situated at an elevation of 62 feet (19 m), and the state capital of Sacramento has an elevation of 30 feet (9 m). The extremely high elevation of Mammoth Lakes has a strong effect on weather conditions in and around the town. Mammoth Lakes has a humid continental climate with relatively warm, very dry summers and freezing winters with a lot of snow. Snow can fall in Mammoth Lakes at any time from October through to May, with more than 200 inches of snow falling each year. The period of June through to September, however, is very dry. The warmest month of the year is July, while the coldest is January. One of the most common reasons people visit Mammoth Lakes is to ski at the Mammoth Mountain Ski Area. This large ski resort includes more than 3,500 acres of skiable land and features 150 named runs, with difficulties ranging from beginner up to advanced. The base elevation of the Mammoth Mountain Ski Area is 7,953 feet (2,424 m), while the top elevation is 11,059 feet (3,371 m). 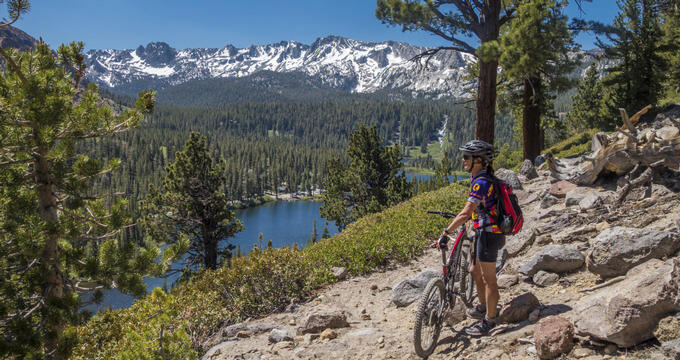 Other attractions at Mammoth Lakes include the natural hot springs, Mammoth Ski Museum, and activities like hiking, mountain biking, and camping.